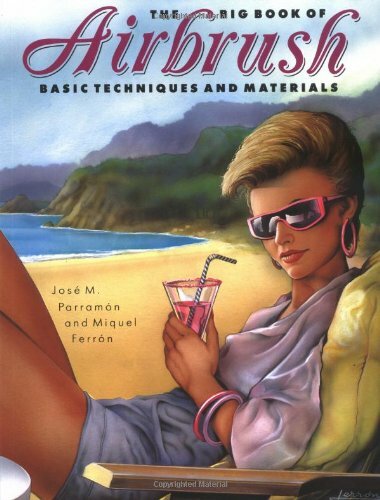 Comprehensive, lavishly illustrated, and loaded with specific, step-by-step instruction, this book is for budding illustrators and graphic designers seeking a basic guide to all aspects of the art of airbrush painting. The Big Book of Airbrush provides a thorough overview of all the equipment techniques associated with the medium. Artists will learn how to render basic geometric and three-dimensional forms, light and shadow, and perspective; how to work with masks and handle color; and how to use photography as an adjunct medium. Clearly presented lessons show how to compose finished, professional-looking images that incorporate the full range of airbrush effects, from hard-edged reflections on chrome to delicate skin tones. Works by several world-renowned airbrush artists are included. José M. Parramon is a prominent artist and teacher and the author of more than two dozen internationally published books on drawing and painting. In 1974 he established the leading Spanish publishing firm Parramon Ediciones, S.A. Miquel Ferron, a professional graphic designer based in Spain, teaches at Barcelona’s prestigious Massana School. He is the author of Airbrush Painting (Watson-Guptill Artist’s Library).